Outside pressures continue to drive up the cost of electricity. Lane Electric (LEC) offers a broad range of affordable products and services to help members use energy wisely and lower their electric bill. What Drives the Cost of Electricity? Wholesale power (cost to generate energy you use) – or every dollar collected, 40¢ or more goes toward LEC’s wholesale power costs. LEC purchases all of its energy from wholesale providers via long-term power purchase contracts, and then delivers it to your home. This accounts for more than 60% of LEC’s total costs. Our providers have experienced cost pressures in recent years that are likely to continue into the foreseeable future. Increasing capital costs for new transmission lines and power plants, fuel costs, EPA regulations, and renewable energy mandates are among the main cost drivers. Delivery cost (delivering the energy to your location) – These are LEC costs to get the electricity to your home or business. LEC’s Delivery costs have been very stable over the years, and we expect this trend to continue. These costs include: depreciation and interest for our distribution plant, as well as operations, maintenance and administrative expenses. LEC has thousands of miles of line to maintain. As with all things, the system ages and updates need to be done to maintain reliability for members to ensure safe and reliable electricity is being delivered to your home and business. How Does LEC Control Costs? All utilities across the nation – electric cooperatives, municipals and investor-owned utilities – are looking for long-term solutions to the challenges of rising costs. LEC is not the only utility experiencing increases. Offering money saving programs – LEC offers members a number of programs that save millions in wholesale power costs each year by avoiding short-duration, high-cost power purchases. Local operating costs – Although the industry is changing, LEC is doing its best to hold the line on its local operating expenses. How Can Members Control Costs? Members have control of their rate choices and energy usage. It’s a system of checks and balances in helping members understand their personal energy usage. Participate in LEC’s energy saving programs – These energy saving programs have extremely positive impacts and can offer huge savings of 10-50% off your electric bills. Monitor your usage with Energy Check, LEC’s free online program – Using Energy Check, look at the daily electricity usage graph on the back of your monthly electric bill. Many factors influence energy use: behavior of household members, appliances, lighting, machinery for business applications, the number of people within your household and weather conditions all have an impact. Talk to elected officials about mandates affecting the cost of electricity – visit www.ourenergy.coop for ways to participate and voice your opinions. 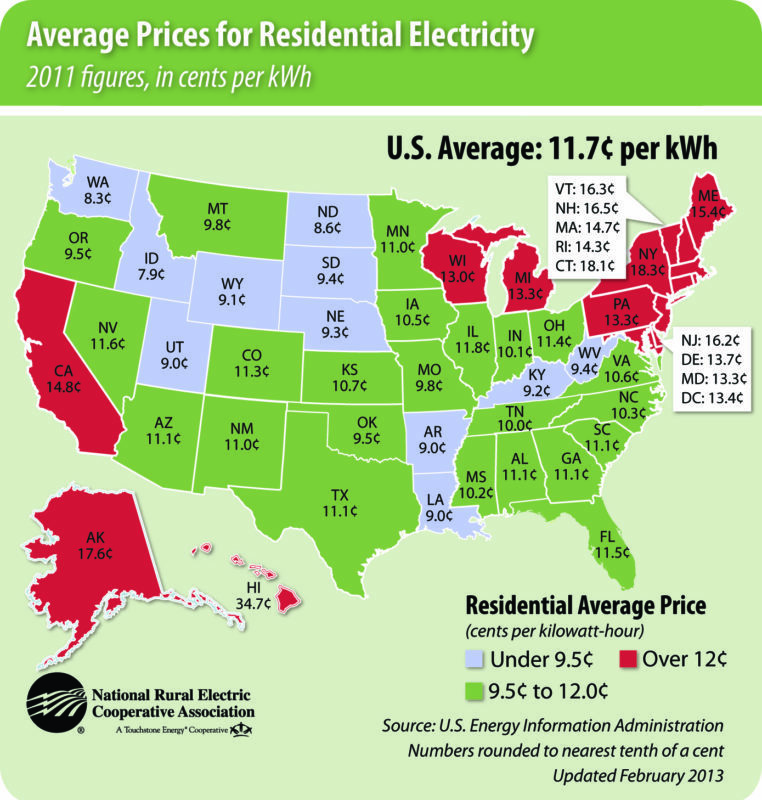 How Do Electric Rates Stack Up?